pistachio – tlc. | tender love and cupcakes. tlc. | tender love and cupcakes. Winter is a cookie season. December, yes, with its holiday cookies and cookie swaps and neat little DIY boxes tied with ribbon and full of festivity–but winter, as a whole, is a season for warm cookies fresh out of the oven, paired with a piping hot cup of black tea with milk. Even though Chicago can’t decide whether or not winter is actually happening this year, I dream of gooey, melting chocolate chunks and sugar-dusted buttery crumble. Then again, maybe this is just me developing a shortbread obsession this season. Over winter break, I made a grand total of seven different kinds of cookies, five of which were variations of shortbread. I have zero regrets about this, for the record, and I doubt any of my friends and family do, either. One was a repeat recipe: chewy coconut lime sugar cookies, enhanced this time by rubbing lime zest into the sugar I used for rolling. The remaining six, however, were all new ventures. I didn’t properly photograph all of them, but I’ll be unrolling the ones I did, hopefully in time for you all to try them out before spring starts appearing. 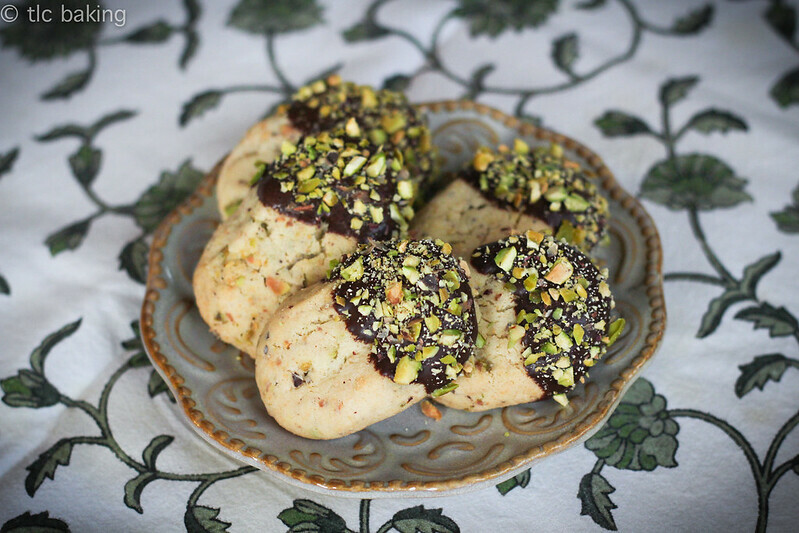 We start the lineup with easily my favorite of them all: chocolate-dunked pistachio shortbread, recipe courtesy of Food52. These rich cookies are shockingly easy to make, yet bursting with flavor. 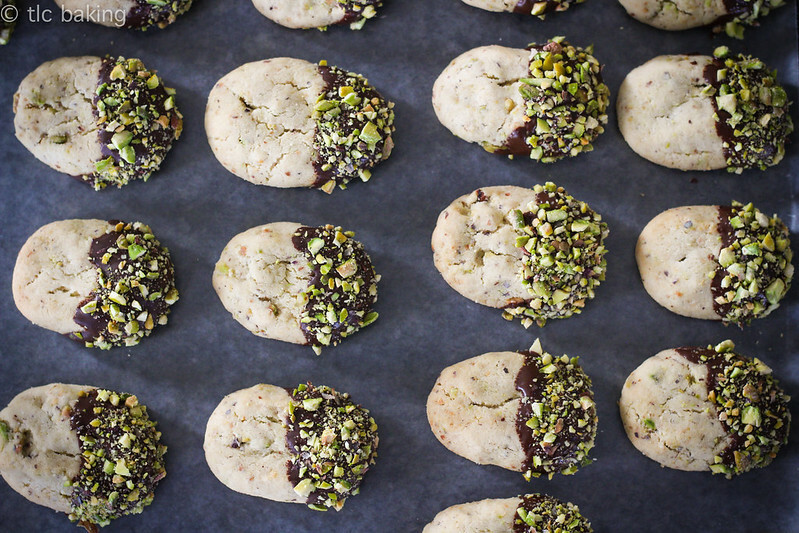 Melt-in-your-mouth, crumbs-on-your shirt shortbread is made even better with the bright green, buttery crunch of fresh chopped pistachios and a smooth and generous coating of semisweet chocolate. Ever since my stay in Turkey, I’ve been craving a good pistachio dessert. Pistachio ice cream, pistachio-and-cream-filled pastry, and even pure pistachio paste–Turkey just knows how to turn these little nuts into an intense and luxurious experience. And let me tell you: with nearly a full cup of chopped nuts, these cookies do not skimp on the pistachio experience. If you buy your nuts in small packages at a standard grocery store, this recipe could get expensive. I highly recommend trying something like Costco or a South Asian/Middle Eastern grocery store to buy nuts in bulk. Much more affordable, and who doesn’t want a bag of leftover pistachios to munch on? As for the chocolate-dipped part: you don’t need a double boiler, and you don’t need super high-quality chocolate for these to be absolutely delicious. I melted dark chocolate chunks (not chips!) in the microwave in 15-second bursts, and that was perfect for coating half of each cookie in a thick, smooth layer of chocolate that hardened nicely after a few hours. I sent some of these home with the boyfriend after he visited, but to be honest, I mostly ate them myself. Like I said: zero regrets. To my UChicago friends, happy 8th week! And to everyone else, happy last week of February! May the remainder of your winter be crisp and cookie-worthy. Whisk flour, baking powder, and salt in a medium bowl and set aside. In a large bowl, beat butter and sugar until smooth. 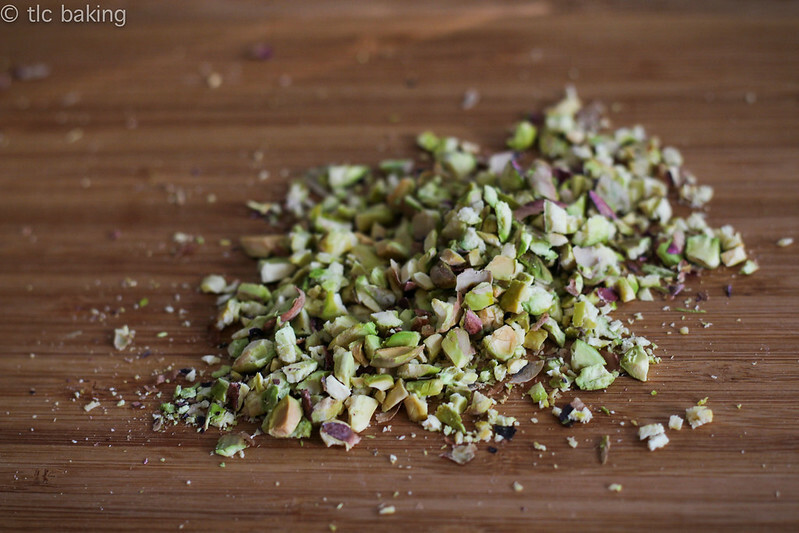 Mix in 1/2 cup pistachios and vanilla extract. Add dry ingredients and beat until just combined. Shape tablespoonfuls of dough into logs 2-3 inches long (~20 of them). Place on lined baking sheets about 1 inch apart. Bake until just golden around the edges, 18-20 minutes. Let cool completely. Melt chocolate (in a double boiler or in the microwave, carefully), stirring until smooth. 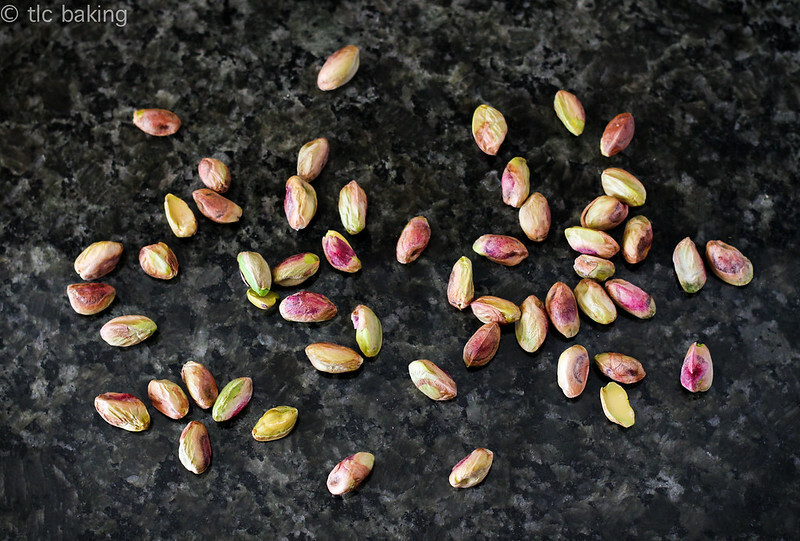 Place remaining 1/3 cup pistachios in a shallow bowl. Dip one end of each cooled cookie into the melted chocolate, covering about 1/3 of the cookie. Let excess chocolate drip off. 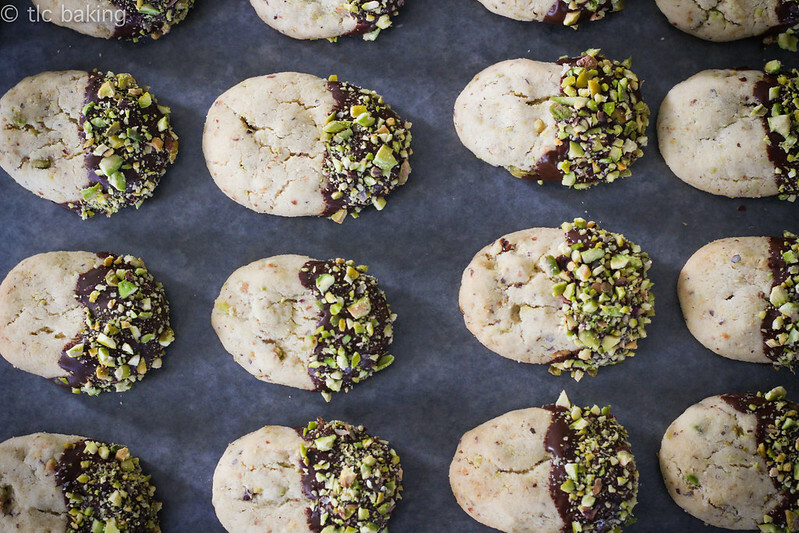 Roll chocolate-covered end in chopped pistachios, then place on a clean sheet of wax paper or a cooling rack. Repeat with remaining cookies. Let stand until chocolate has hardened--at least one hour. Cookies will keep in an airtight container up to 1 week (if you can make them last that long).